Are We Misdiagnosing the Cause of Gun Violence? Guest column: Let’s stop blaming mental illness for mass shootings. In the aftermath of the largest mass shooting in modern U.S. history, words like “demented,” “insane,” “sick,” and “madman” peppered official responses, media coverage, and public speculation. How else could we explain the tragedy in Las Vegas? But such loaded language obscures a simple fact: The majority of mass shooters do not have a diagnosed mental illness. More of us need to realize that it is wrong to automatically assume that mass shootings and mental illness go hand in hand. We often put mass shooters—particularly when they are white—under the umbrella category of mental illness. Possible diagnoses are mulled over by the media, hinted at by those who knew the perpetrators, or simply assumed. But this fallback on mental illness, or other disability labels, flies in the face of data about mass shootings. Less than 25 percent of the perpetrators of modern mass shootings have had a diagnosed mental illness. Still, mental illness remains one of the primary explanations after these types of tragedies because it fits our cultural script. Whether or not it is a factor in specific massacres, mental illness is central to how we as a society now interpret mass shootings. In our private lives, a diagnosis of a mental illness can bring a sense of logic to the senselessness. It makes symptoms suddenly intelligible, and can sometimes offer opportunities to bring it under control. Similarly, the assumption that mental illness is a reliable factor in mass shootings helps society create a sense of logic in the face of unspeakable—and very public—tragedy. We try to understand the situation in order to gain some sense of control, however vague and amorphous. It becomes both an isolated tragedy and another piece of a growing line of similar stories. We attempt to rein it in by giving it a name. But our reliance on this myth helps nothing. We know this, in part, because active shooter incidents have increased significantly since 2000. We have seen the images and, for better or for worse, now have unprecedented access to audio and video footage of these events as they unfold. Yet we do not understand any more than we ever did. The assumed, yet unsupported, link between mental illness and mass shootings is perhaps doing more harm than good. The mentally ill mass shooter is far more real in our collective imagination and fears than in real life. This is not to say that mass shooters are typical or even rational—clearly, most of us would never dream of committing such an act. However, relying on assumptions of mental illness as an explanation not only stigmatizes individuals who struggle with mental health, it also obscures the complexity of mass shootings as a relatively new phenomenon in the U.S. There is certainly more to this puzzle. Commentators and experts point out the arbitrariness of focusing on mental illness when other factors, notably male gender, are much more strongly correlated with becoming a mass shooter. And yet something about it resonates. As we have seen in recent years, non-white perpetrators are far more likely to be discussed in the parlance of terror, with keywords such as “radicalization” emerging from the start. Yet almost immediately after the shooting in Las Vegas, officials were quick to declare that it was not terrorism. The cultural script of terrorism did not fit—not for a white shooter. We as a society remain fixated on medical explanations for everyday life. They give us a sense of trust and comfort. We want a diagnosis to explain difference and, ultimately, horror. But this is shortsighted. The question is not necessarily whether mental illness is a factor, but rather why it continues to be the de facto first step. Mass shootings have become far too normal in part because we have allowed them to enter our social worlds. We simply have relied far too long on the scapegoat of mental illness. Elizabeth Lewis is the project manager for the Texas Center for Disability Studies at The University of Texas at Austin. Opinions expressed by Texas Monthly guest columnists are their own. As the writer notes, we tend to say “mental illness” because we have to believe that someone who can do such a thing is not like the rest of us….that he is somehow different…..and, where we cannot blame his religion or his politics….we reach of the nearest excuse—“he’s sick”… That may well be true…I am not qualified to say otherwise…but since there have been mass murderers throughout human history, it is very old illness and more common than we would like to think. At one time, they might have said the perpetrator was “evil” or “possessed of the devil” but on other occasions—especially when the victims were “others” or “the enemy” of “not our kind of people”—they have even been hailed as being heroes. What happened in Las Vegas is, horribly, not that uncommon in history…..it is just that by making guns so available we have made it possible for something that might have taken several people to accomplish- possible by only one. Hell, under Obama’s AG Holder, you could get the ATF to supply assault weapons to you…if you were a drug running killer. Perhaps mental illness is the go to because it has become so normalized. With the (((media))) pushing obviously mentally deficient transgenders as rational people, the lines become easily blurred. Why don’t you take your anti-Semitism, hatred, and bigotry back to 4chan or Stormfront where it belongs. Sure, the second you take your anti-freedom, communist loving self to Israel. For those of you that may not know, triple parenthesis is a symbol used by anti-Semitic members of the alt-right to identify certain individuals as Jewish. So what Randall is indicating by “(((media)))” is that the media is Jewish influenced/owned. Yes, a provable fact, unlike your transgender fantasies. Look at his disqus profile. I blocked him. Data shows the vast majority of gun homicides in the U.S. are perpetrated by the Black and Hispanic permanent criminal underclass, not by mentally ill people. Not sure if there is a strict definition of what constitutes mentally ill. For sure, one who commits mass murder of those who has no real connection is mentally off balance. The truly sad thing about guns and mental illness is that the NRA stopped legislation that would have denied people who were actually mentally ill from purchasing guns. act with lightning speed in striking down a sensible Obama administration rule designed to stop people with severe mental problems from buying guns. President Trump, who championed the National Rifle Association agenda as a candidate, is expected to sign the regressive measure. This, despite the Republican mantra that tighter control of mentally troubled individuals — not stronger gun control — is the better way to deal with the mass shootings and gun carnage that regularly afflict the nation. The Senate voted Wednesday to join the House in revoking the rule. It would have required the Social Security Administration to add about 75,000 people, currently on disability support, to the national background check database and deny them gun purchases. These individuals suffer schizophrenia, psychotic disorders and other problems to such an extent that they are unable to manage their financial affairs and other basic tasks without help. The Obama executive order (not “legislation”) you reference was opposed by a wide array of socio-political groups including veterans’, senior citizens’, and mental health advocacy organizations, as well as the ACLU. The NRA did not “stop legislation”, legislation was required to overturn the executive order. That legislation passed in Congress and was signed by the POTUS. The truly sad thing about guns and mental illness is that the NRA stopped lobbied hard against legislation a rule that would have denied people who were actually mentally ill from purchasing guns. Partly true. Yes, the NRA opposed the order, but so did many other civil liberties groups across the political spectrum. So your singling out the NRA as the Boogeyman here is not telling the whole truth. The opposition to the order was due to the fact that it cast a net over those that had never been adjudicated mentally ill. The order affected people that received SS benefits and used proxies to administer their benefits, of which many were veterans and senior citizens. It was overreaching and could have denied 2A rights to people with no just cause. The rule also contained provisions for any person added to the FBI list to be removed by petitioning the courts. So have your 2A rights taken away with no due process or just cause, then the burden is on the individual to take the feds to court to have those rights re-instated? No thanks. Nevermind that if a person is collecting SS disability benefits, they very likely would not have the resources to retain an attorney. SSA disability payments are meager and rarely cover more than basic living expenses. Where are these people getting money for guns? So I’m guessing I am buying that gun with my SSA payments. I am buying guns for people who are not even mentally capable of handling their own financial affairs, so it must be their executor who actually buys the gun. With my tax money. I am not sure why you are OK with that. I’m not. I’m not going to argue a hypothetical. People use third parties to handle their finances for a variety of reasons. It is wrong to assume that people receiving SS benefits do so because they are not mentally fit, without their being adjudicated mentally ill. And the hypothetical purchase you describe could easily be classified as a straw purchase, which is already illegal. There is no hypothetical here. These people did not choose to assign their responsibilities elsewhere. I am paying for their upkeep because they cannot handle their finances. Their mental condition is the reason for their benefits. They cannot buy their own guns. So your proposals is that everyone is entitles to a gun even if I have to buy it for them. That is ludicrous. Wrong. The order itself reclassified those people as mentally unfit without due process, as in a judge ruling that the person was mentally ill. Existing law requires an adjudication. Wrong. They were adjudicated when their benefits were assigned to someone else’s care. I wonder how many Alzheimers patients have bought guns. I wonder how many were adjudicated in court as unfit. I think I see the problem here. You know that all those folks willingly assigned their financial responsibilities to someone else. Kinda like handing your wife the checkbook and asking her to take over bill paying. I, however, believe the vast majority of the recipients had a fiscal guardian appointed for them, likely against their will. Or perhaps they are beyond having a will of their own. In any case, this requires the intervention of a magistrate. How bout if we just keep guns away from the people who are unwillingly not in charge of their own affairs? Existing law already disallows firearms purchases for those adjudicated mentally ill. If these people are not handling their own affairs because they have been legally declared mentally ill, the existing law is enough to stop them legally purchasing firearms. Reimposing the assault weapons ban would be a good start. I suppose you saw the story about how the Trump Administration (sic) clarified a dispute about the coverage of the Bradly Law provision that banned “fugitives from arrest” from buying handguns. The result means that more than 500,000 people who were banned are now allowed to arm themselves. In fact, they do have “mass murderers” in other countries….it is just that, since guns are harder to get, they have to be “mass hackers”, “mass stabbers” or “mass truck driver overs” rather than “mass shooters”….This tends to reduce the size of the available “mass” but it is not from lack of trying. And your solution is??? Allow everyone one revolver and 50 rounds? Our country has so many weapons in circulation now that shutting down the sale of new ones would accomplish squat when it comes to mass murders. The good guys would not be able to purchase one, but the bad guys, bent on killing, would just purchase underground. This seems to be lost on many of you. Do you think that Trump would not be talking about abandoning Puerto Rico —and its US citizens—if (a) they were praising him more (b) they could vote in the presidential election and (c) they were not Hispanic?…..probably a combination of the three. Sorry, Donald, they may seem “foreign” to you…but they are Americans. He also stokes his base by criticizing POC. I kind of enjoyed seeing Gov. Abbott’s yowl yesterday that Texas isn’t getting enough money for Harvey from the feds because the bill does not specifically earmark it for us…and especially for the Houston area…..I suspect that someone will claim that this means that, since the voters in Houston did not support Trump, that it is getting the “Puerto Rico” treatment….When, in fact, the Congress stopped “earmarking” appropriations some years ago as a GOP “reform”. But since Abbott has proven that that he does not know how his own legislature works, why should we expect him to know how Congress operates….. 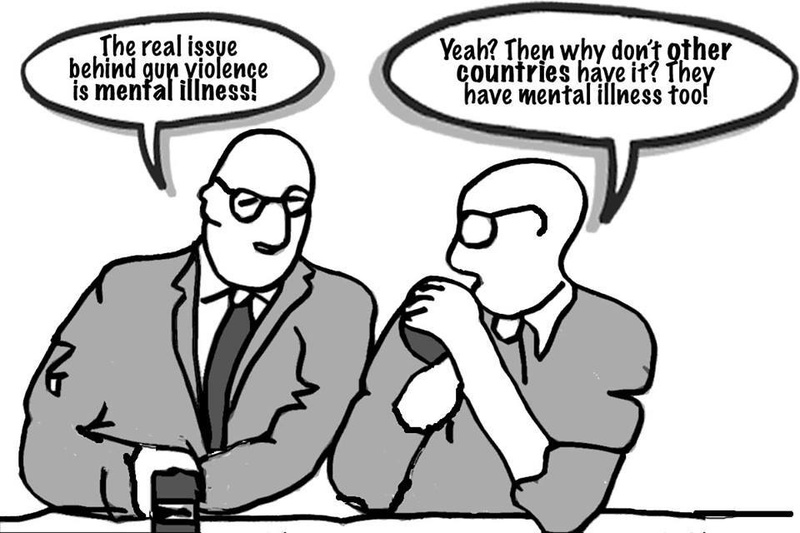 Anyone who kills humans, unless in self-defense, is mentally ill. The author provides no alternative reason. I was afraid I was wasting my time reading this tripe. I want my 10 minutes back. When your employer starts to tell you how he has gotten you this great new health insurance plan thru the new TRUMPCARE executive order I suggest you check the small print very, very carefully to discover ALL the coverage you once had that will no longer be available….In fact, the policy will probably not even match the MINIMUM coverage mandated by our own Texas Legislature….But, cheap it will be. BOOM! Another off topic post from Professor Pedant. You appear to be the only one who seems to have a problem with his posts. Others that don’t want to read off-topic posts have the mental flexibility to not let it bother them. Since Atty. Gen Paxton, Gov. Abbott and Lt. Gov. Patrick are such strong advocates of “state rights” and not having the federal government tell us how to run our business…..I wonder if they are going to immediately go to court to challenge president Trump’s new attempt to “subvert” Texas’ right to establish what it believes should be the minimum coverage provided by an insurance policy….Texas has made its choice—by action of the Legislature—to set the minimums it believes are best for Texans but here we have a FEDERAL official acting to allow the sale of policies in Texas that do not meet those standards. State Rights! take a look at the America’s two “NRs”—The New Republic on the slightly left side of the spectrum and The National Review on the other. Both are available by subscription (I subscribe to The New Republic), on the newsstand at your local general bookstore (if you have any left where you live) and in growing presences on the web. Neither is perfect….The National Review, for example, was founded by William F. Buckley Jr. who never seemed to be able to escape from the snobbishness of second generation money that went to Yale and a not-well-placed admiration of Sen. Joe McCarthy while the founder of The New Republic never overcame the inability of some of the intellectual left to understand the difference between communism in theory and Stalinism in reality…..But both have grown beyond those myopias. Today they offer you a quick look into the world of thought of semi-classical to classical American conservatism and liberalism that can keep you up to date with what rational people on the right and left are thinking about. I read both regularly. I think it keeps me thoughts more balanced that way. you can see and hear with your own eyes and ears, but I would not be recommending them to you if I thought you were that kind of a person. P.S. If you’d like some coverage of more of the world then you should add the British weekly The Economist to your reading list. Speaking of The National Review, today’s lead piece on the web was a comparison of the situation in 1968, nearly 50 years ago, when the country seemed to be coming apart and today when some fear the same is happening. I question only one distinction they made between the two periods—the incoming president back then (Richard Nixon) may have been–as history suggests—an evil man full of psychoses BUT he was rational enough and knowledgeable enough to know just how far he and this country could go. The “Mad Nixon” play to North Vietnam was just that. He also did not seem to have some compulsion to compare the size of his hands with every other male in the room…Unfortunately, you cannot say any of that about the current occupant of the White House. Today’s interesting piece from The National Review talks about how the conditions of today are very similar to those in the “Gilded Age” at the turn of the 19th-20th Century…..social and economic conditions that gave rise to the progressives in both parties and to Teddy Roosevelt in the GOP. I’ve been using the Gilded Age to describe our society for about ten years. It seems to be getting worse. Unfortunately, most people have so little knowledge of history that the reference is lost on them. Well, you poo-poo the places right wing conservatives go for info; where do you go for current news and commentary…besides the Econimist. I find the Economist, overall, to be a good read, because they, unlike you, gave Trump a chance of winning election because they were objective and unbiased. You on the other hand…. Dontcha wish a college professor offered up a bit more to back up her statements. “Only 25% are diagnosed as mentall ill.” Think she means only 1/4 have seen psychiatrists and been diagnosed? In my mind 100% of them are certifiably crazy, even if not professionally declared so. Anyone thinking that a person who picks up a weapon of any kind and goes on a killing rampage might be sane might, themselves, be a bit goofy. Radicals are crazy…be they white and shooting out a hotel window, black and killing their neighbors, or terrorists using bombs, big trucks or airplanes. Sane people do not randomly kill total strangers. I thought this opinion piece was very poorly conceived and written. Mentally ill….overblown male aggressiveness or whatever may be the “cause” of these periodic—growing more frequent and more bloody—out bursts of murder…..the nagging question to which no one—certainly including me—is what is the answer? How do we stop them. Some say: gun control…..but we already have several hundred million guns and rifles, etc. in this country and, barring a massive effort to make people turn them in, someone what REALLY, REALLY wants a gun is going to be able to get one…..That does not, however, mean that we should not do what we can to limit at least some people from getting their hands on weapons and/or that we should not ban the future sale of the kind of semi-automatic (convertible in some cases) to automatic weapons used by the Las Vegas shooter….There is NO rational reason why a regular American needs one of these….other than the possibility that he gets a little sexual thrill out of it….Second amendment not withstanding. we certainly don’t need more of them. Even if we cannot take those already in existence out of circulation we can at least keep more from being sold. Some actually claim that the answer is to arm more people so that we will all be constantly ready to defend ourselves…..in some sort of handgun level “mutually assured destruction”….Of course, hundreds of those in that crowd at Las Vegas could have had handguns and that would not have changed anything when the shooter was high above them and firing hundreds of rounds into the crowd. Better mental health care and screening…Of course, but see if you can get the money to pay of what is really required out of the Dan Patrick’s of this world. They will “talk a good game” but paying for it is another thing. Increased security—after all, how did he get all those guns into that hotel?..But, do we all want to live in a world where going anywhere is like taking a flight at the airport? I know I don’t. Just living with it and accepting–as some fool said again the other day—that Las Vegas’s are “the price we pay for our liberty”? So, I say to the JJs of this world…WHAT IS YOUR SOLUTION? So, after my post, you lump me in with all the “do nothing” advocates? If the BCinBCS NYT’s link is true, without exception, than I am truly mystified. Were there add-on’s to this bill? No firearm should be sold to a convicted felon or someone certified as mentally unstable, but every American not falling into one of these categories should be prohibited from having the same weapons the crooks and gangs already do. It is my understanding that most policeman are only carrying a sidearm and a shotgun with them in their vehicles. Why? Why aren’t they all carrying a semi-automatic rifle in the truck of their cars? If the bad guys have the firepower, I want all the good guys to have it, too. One other point…back when Whitman did his thing from the tower, it was broadcast all over the world…one three channels and in major newspapers. Most Americans probably never saw anything about it. Tell me how we fight this? Anyone? The rule also contained provisions for any mentally ill person added to the FBI list to be removed by petitioning the courts. As far as I can discover, that was the extent of the rule. There is something mentally wrong with those who are enamored with guns, especially those that go beyond hunting rifles/shotguns. Not sure it would be mentally ill, but something is wrong with those who are so fascinated with their toys. We will not solve the problem until the illogical love of guns is replaced by something. Not happening soon. I think WUSRPH may be right by suggesting that there is a connection between the feel, smell, and recoil of a gun and the gonads. Is that mental illness? Probably not, but it is a mental issue, at least in my mind. I’ve never met anyone who is a real gun enthusiast that I enjoyed being with socially. They are just off center.